Published: 7/11/2013 By Dr Weil. I am increasingly persuaded that consuming modest amounts of natural saturated fats such as virgin coconut oil is not hazardous, although some controversy still persists. However, using cosmetic products containing coconut oil is another story – there is widespread agreement that such products are safe and effective. Although I prefer skin care products with natural anti-inflammatory activity, some components of coconut oil have been studied for their benefits to both skin and hair. 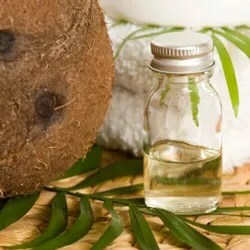 The lauric acid found in coconut oil is available in a wide variety of skin and hair care products, including body and facial cleansers, soap and sunscreens. Clinical research supports the safety of these products in general, and the utility of coconut oil to help moisturize skin in particular. Try them! Posted on April 21, 2014, in Uncategorized. Bookmark the permalink. 3 Comments. I add a small amount to my porridge every morning. It tastes delicious. We use organic cold pressed coconut oil neat – on our skin (great sunscreen, as well as moisturiser and repairer), and in our food (to cook with and ingest). This is a great product, and its ant-inflammatory properties are well researched.